This entry was posted on November 10, 2016 by Texas Safety Supply. 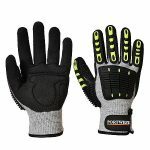 The Portwest A725 impact glove is right on time for winter months and the need for cold weather oil field impact reducing gloves. The Portwest A725 cold weather gloves offer 100g Thinsulate Insualtion to provide the protection from the cold in the winter months. Impact protection, cold weather impact gloves along with POD TPR design for proection from injury. The Portwest A725 is oil and water resistant that is a huge need for winter months as well as a PVC Dotted palm that improves grip and handling in cold, wet and snowy conditions to help prevent hand injuries. This is a durable glove that is going to last. In addition to the Cold weather benefits the Portwest A725 is ANSI cut resistant Level 2. Cold wet weather. 100% waterproof. This is exactly what is needed to protect your hands from becoming cold and wet. the toughest conditions can cause problems and lost attention to the task at hand when the user's hands become cold and wet. It can be miserable. The purchase of the Portwest A726 Winter impact gloves can help with that. The Portwest A726 provides a 100 gram thinsulate liner for protection from freezing temperatures. PVC dots on the palm give the grip that you need to prevent slippage in the hands. A very good glove at a very good price with the added benefit of an impact Glove that provides ANSI cut level 2 protection. Also provides reflective trim to provide better visibility for all. Portwest A722 is an economical Impact Glove with Cut protection. The Portwest A722 offers ANSI Cut Level 4 Protection at a favorable price of $13.49 per pair. In general, that typr of cut protection in an Impact glove would translate into a glove price of more than $20 per pair. Texas Safety Supply can offer additional discounts on Bulk impact glove purchases or volume buys of Impact Gloves. The A722 has a sandy palm which is great for providing a grip that sticks and holds up. The wrist has a hook and loop closure ensuring the user of perfectly adjusted fit. The sandy rough grip may even hold up when there is oils or grease present. The liner is very breathable to keep the hand from getting too warm, so the A722 is a Good glove for most seasons of the year. 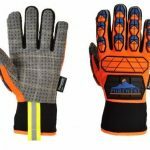 The Portwest A721 provides an Impact Glove with Cut resistance, ANSI Cut Level 3 Protection for the User at a great price of $10.99. 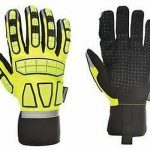 They provide a Padded palm that makes these gloves comfortable to wear and gives extra use and durability. Many gloves begin to tear and rip in the thumb and first finger seam where they adjoin. Not so with the Portwest A721 impact glove. The Portwest A721 has a sandy palm that provides a better grip for use on oil rigs when its cold and wet and work is in tough conditions. 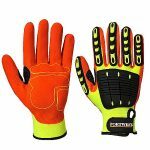 The Liner makes it a Good choice in an impact glove that can be worn year round.